For the finale of this series of maps of Shoreditch by Adam Dant, it is my pleasure to publish the Map of Shoreditch in Dreams which Adam drew in 1998 as his first map of the neighbourhood. As before, you simply have to click on the image above to examine it in detail. Taking his cue from the Jungian Society Lecture, Adam set out to collect the dreams of his neighbours and other residents through surveys and in conversation. Then he portrayed them all on the map you see above as a means to illustrate the heaving and teeming collective unconscious of Shoreditch. And I was astounded when Adam showed me the huge original drawing done directly in ink onto a piece of paper that is a metre square, without any single mistake or even an inkblot that might open itself to interpretation – almost obsessive compulsive in its neatness, you might say. As we commenced our cartographic analysis, Adam explained that his orientation was looking to the West with a rat-infested Shoreditch High St crossing the map laterally, before he began to introduce me to a selection of the motifs. In the bottom left of the map, he pointed out the tiger prowling the streets continously and, further up to the right, the facades of the Boundary Estate propped up by wood, and then, over in Hoxton Square, the giant Teddy Bear at its centre. Images pregnant with meaning yet resisting simple interpretation. Most fascinating to me were the elements of premonition within the map – the giant pizza outside the Tea Building on the corner of the Bethnal Green Rd exactly on the site of the new pizza restaurant which opened more than a decade later and the bendy bus in the centre right of the map, drawn years before these strange vehicles became actuality. 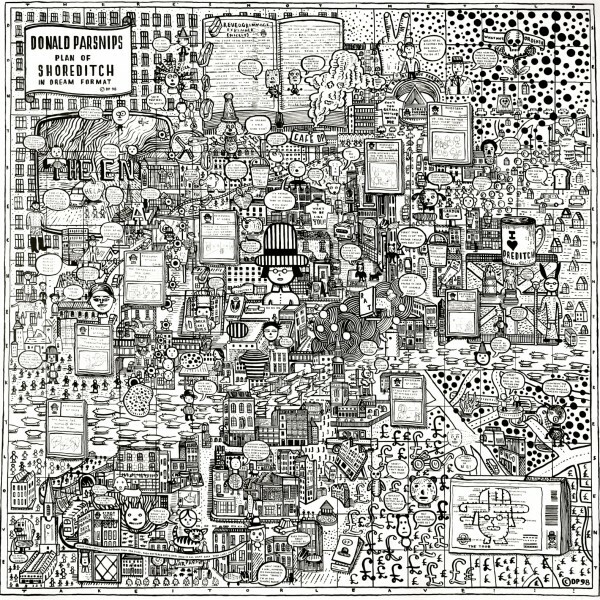 You will note that this map was drawn and published under the name of Donald Parsnips, which was Adam Dant’s creative alter-ego at this time, and it is the image of Donald Parsnips in his tall hat that dominates the centre of the chart, produced when Adam was also publishing “Donald Parsnips’ Daily Journal” distributed in a daily edition of one hundred copies free to the people of Shoreditch. Subsequently, Adam produced maps of Shoreditch under his own name, but whether we can infer some kind of reconciliation of the ego and super-ego as a result of his work in cartographic interpretation of Shoreditch in Dreams, I leave you to decide for yourself. A cross section of Shoreditch in Dreams. You may also like to take a look at Adam Dant’s Map of Shoreditch in the Year 3000, or his Map of Shoreditch as New York, or his Map of the History of Shoreditch, or his Map of Shoreditch as the Globe. 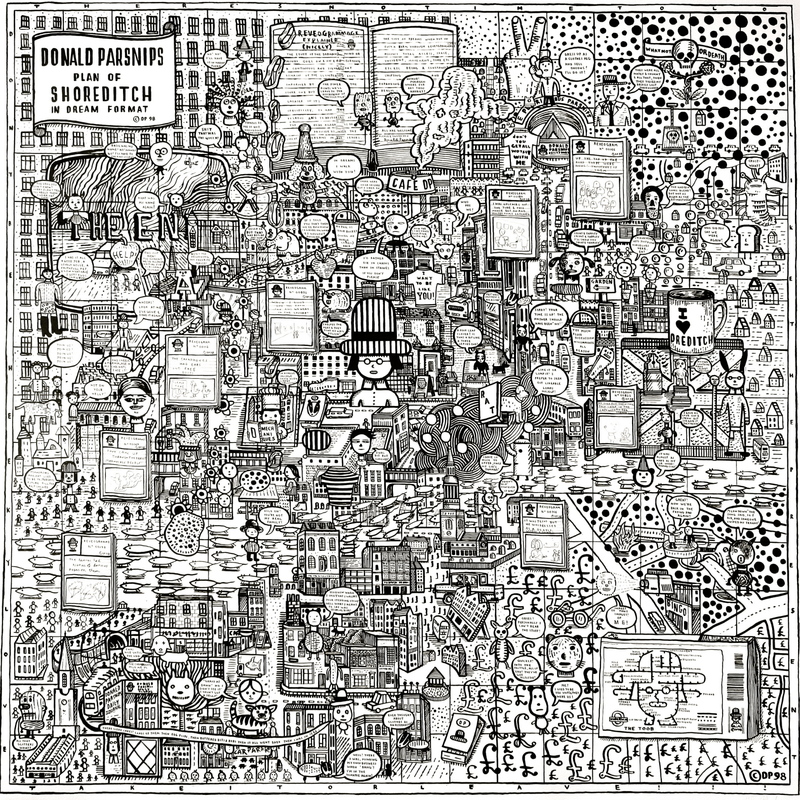 Adam Dant’s current exhibition Dant on Drink runs at Hales Gallery, 7 Bethnal Green Rd until January 8th. This is now the background on my computers screens. Dreaming is one of my many skills. To be able to record them by a drawing is such an ace idea. So impressed!